Three more days | India, Ink. As an ardent textist—one who is concerned with language, typography, and the way the two interact to help us comprehend and share ideas—I am both anxious and excited to discover how electronic reading ­software affects the reading experience, positively and negatively, and how it can be improved. 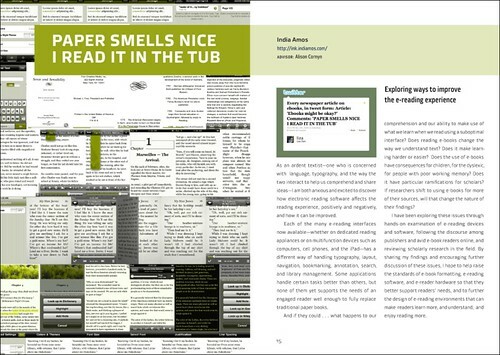 Each of the many e-reading interfaces now available—whether on dedicated reading appliances or on multi­function devices such as computers, cell phones, and the iPad—has a different way of handling typography, layout, navigation, bookmarking, annotation, search, and library management. Some applications handle certain tasks better than others, but none of them yet supports the needs of an engaged reader well enough to fully replace traditional paper books. And if they could . . . what happens to our comprehension and our ability to make use of what we learn when we read using an electronic device? Does reading e-books change the way we understand text? Does it make learning harder or easier? Does the use of e-books have consequences for children, for the dyslexic, for people with poor working memory? Does it have particular ramifications for scholars? If researchers shift to using e-books for more of their sources, will that change the nature of their findings? I have been exploring these issues through hands-on examination of e-reading devices and software, by following the discourse among publishers and avid e-book readers online, and by reviewing scholarly research in the field. By sharing my findings and encouraging further discussion of these issues, I hope to help raise the standards of e-book formatting, e-reading software, and e-reader hardware so that they better support the many types of reading we do, and to further the design of e-reading environments that can help readers learn more, understand more, and enjoy reading more. In other news, I’m moving this blog to my own server. Effective . . . now? I’ll cross-post the next few things to both locations, but I’m closing comments over here to keep all in one place any discussion that may arise. So if you have something to say about the above effusion, please say it there. I’m still fixing broken links and glitches from the move, so if you notice anything weird over there, please drop me a note: india at indiamos.com. And, no, the blog template is Not Yet To My Liking, either, but it’s better than this one; it can wait until after Thursday.